Adding some shelving like the one above on a wall in your kitchen not only gives you the ability to grow herbs or plants in your kitchen but it also gives your kitchen a decor focal point. 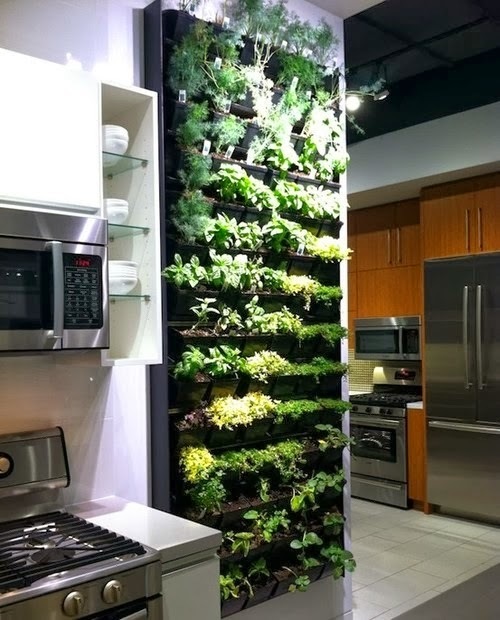 Whether you use artificial plants or real garden herbs this idea can give your kitchen a unique touch. Wouldn't it be nice as you're cooking to just walk to your garden and pick some fresh herbs to go into your dish? This type of garden allows you to take a couple steps and shop at your own herb market that you created. This allows you to do this regardless of what climate you live in or what time of year it is. It can also be used as a decor piece by placing small plants, cactus or succulents to add some green to your kitchen. The sky is the limit with this great idea. If you have something like this in your home we would like to see it, so feel free to send pictures and we may feature it in one of our publications.